You often don’t see the forest for the trees – this is how the situation in an ERP system could sometimes be described. In our case this means that you have lots of tables in the manufacturing module of Microsoft Dynamics NAV, but you have no overview of situations in which an capacity extension would help you delivering an order faster. 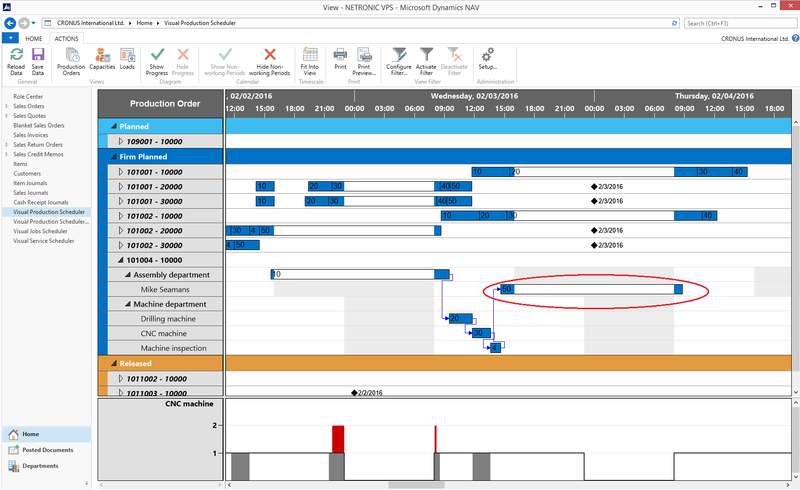 A chronological overview of orders, POL and resources requires a planning board as is provided by the Visual Production Scheduler (VPS), a fully integrated add-in. When would capacity extension be useful? In some situations, a capacity extension to accelerate the completion meets some obstacles. For example, if 17 hours are scheduled for an operation, and you work in a two-shift mode, there is typically not enough time to complete this operation within one day. However, temporarily increasing the respective machine center's capacity by 1-2 hours could help you getting the job done. In the sample above you can see that for the firm planned order allocated to Mike Seamans a little extra time on Wednesday for operation 50 can shorten delivery date of the POL. Working with the Visual Production Scheduler next step is to switch to the Resource View to access the resources to manually extend the working time of the identified resource. Because the VPS is a fully integrated add-in to Dynamics NAV clicking a resource will immediately open the corresponding NAV card where the planner can extend the resource’s capacity in just a few steps. Then refresh the Production Order and reschedule the finish date of the operation. By reloading the data in the VPS the display will be updated and the modified POL with its prolonged working time is shown. We prepared a short video for detailed instructions. Enjoy watching. Interactive planning boards are planners best friends - not only for manufacturing. Read this blogpost about the best way to allocate service orders to resources in Microsoft Dynamics NAV. You do not know the Visual Production Scheduler? Schedule an online demo.